Osmosis: Renal clearance. (2019, April 20). Retrieved from (https://www.osmosis.org/learn/Renal_clearance). Renal clearance describes the volume of plasma completely cleared of a substance by the kidneys per unit time. 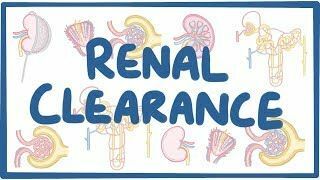 A higher renal clearance suggests the substance may be cleared almost completely in one pass through the kidneys while a low value describes a substance that may not be eliminated by the kidneys at all. Typically this is calculated by multiplying the volume of urine by the concentration of a substance in the urine, divided by the concentration of the substance in plasma (mg/mL). The renal clearance of any substance can be compared with the clearance of , a substance that is freely filtered and neither reabsorbed nor secreted. In order for the body to function properly, it needs a way to get rid of toxins and other waste materials. That’s where the kidneys come in. Their main function is to filter the blood, specifically and remove any unwanted substances from the body. Now, the first step in blood filtration happens at the glomerulus - a tiny bed of capillaries surrounded by the Bowman’s capsule. The glomerular filtration barrier is made up of three layers and together they separate the blood inside the glomerular capillaries from the fluid inside Bowman’s capsule. They work like a sieve, allowing water and some solutes in the plasma like sodium, to pass into Bowman’s space, while keeping negatively charged particles like proteins, or large particles like red blood cells in the blood. The filtered fluid, now called pre-urine, leaves the bowman’s space and travels through the nephron. The nephron is the basic unit of the kidney, and is essentially one long tube bent into a “U” shape. Different sections of this tube either reabsorb substances back into systemic circulation or actively secrete them into the nephron to be excreted in urine. Renal clearance of a substance refers to the how quickly a particular substance is removed from the plasma by the kidney and excreted in urine. So something with a high renal clearance means that it will be quickly removed from the blood, and vice versa. There’s a formula to calculate renal clearance for some substance X. In this formula, C stands for the renal clearance which is the volume of blood plasma that’s cleared of that substance over time in minutes. C equals the concentration of the substance in urine [U]x multiplied by the urine flow rate (V) which is the amount of urine excreted over time in minutes. All of that’s divided by the plasma concentration of the substance [P]x. So, if the urine concentration is high but the plasma concentration is low, then that must mean that a lot of the substance was removed from the blood, leading to a high renal clearance. As a general rule, small, uncharged substances like inulin, which is a small inert polysaccharide molecule, have a relatively easy time passing through the glomerulus. As an example, let’s say that in a 24 hour period, a man has 2 liters of urine, and that his plasma Na+ concentration is 145 mEq/L, whereas his urine Na+ concentration is 190 mEq/L. Since urine concentration is 190 mEq/L, we multiply that by 1.39 mL/min and divide by the plasma concentration which is 145 mEq/L. This equals 1.43 mL/min, so that means that 1.43 mL of plasma is cleared of sodium per minute. So we know how much plasma is cleared of sodium per minute by the kidneys but we don’t know if any of the sodium is being reabsorbed or secreted into urine by the nephrons. This is because clearance is the sum of all of the reabsorption and secretion that occurs for a substance. And in order to tease out exactly how much reabsorption and secretion is occurring, we need to compare it to inulin. Inulin is a polysaccharide that is produced by plants. It is the one substance that’s freely filtered and not actively secreted or reabsorbed. We know because the filtered fraction which is how much fluid is reaching the kidneys and passes into the renal tubules is the same for inulin as it is for plasma. So we can use it to get an accurate estimation of how much fluid is filtered from the renal glomerular capillaries into the filtrate also known as the glomerular filtration rate, or GFR. When we compare the clearance of substance X to inulin, we get something called the clearance ratio. This can be calculated as the clearance of substance X divided by the clearance of inulin.